A123 has to compete on cost and quality with larger, more experienced battery makers, including Sanyo, Hitachi, GS Yuasa, LG Chem and Samsung, analysts say. LOS ANGELES (Bloomberg) -- A123 Systems Inc., moving to overcome engineering and manufacturing setbacks, said it has developed an improved version of its lithium ion cells that the company says can cut costs of rechargeable and hybrid vehicles. The "nanophosphate EXT" cells will be produced next year and can be used longer and operate more efficiently in extremely high and low temperatures than competing lithium ion packs, the company said Tuesday. That reduces the need for systems in electric cars to maintain a consistent battery temperature, said David Vieau, A123's CEO. "That will eliminate weight, cost, technical complexity," Vieau said in a phone interview before Tuesday's announcement. "That doesn't solve all the cost issues but it's a step in the right direction." A123 wants to boost demand for its batteries that are also used in utility grids, telecommunications systems and power tools after forecasting in a May regulatory filing several quarters of "significant" losses that raise "substantial doubt on the company's ability to continue as a going concern." In March, the company said it would spend $55 million replacing batteries in Fisker Automotive Inc.'s plug-in Karma sedan, the result of flaws at its Livonia, Michigan, plant. The company's shares have tumbled 35 percent this year to $1.04 through Monday. The shares have dropped 92 percent since an initial public offering in September 2009, when investors expected A123 to benefit from Obama administration efforts to create a market for rechargeable autos. 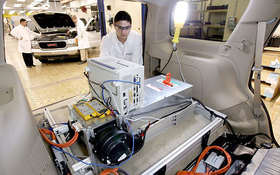 A123 in August 2009 was awarded $249 million in federal stimulus grants to produce batteries in Michigan. The company, with investors including General Electric Co. and Japanese heavy machinery maker IHI Corp., has been developing the new cells for several years, Vieau said. Since its March announcement, Waltham, Massachusetts-based A123 has also revamped factory operations, he said. "We did not do a good job in the last 15 months in our Michigan facility on our cell ramp-up and it's cost us dearly," he said. "We've gone through significant changes in personnel and procedures, and we've brought the plant up much more slowly this year and we're confident." The new lithium ion cells can be produced at a cost similar to A123's current nanophosphate chemistry, he said, without elaborating. The company declined to say how much it charges automakers for its battery packs. The performance of the new cell chemistry was validated against competing cells by Ohio State University's Center for Automotive Research, A123 said. A123 has to compete on cost and quality with larger, more experienced battery makers, including Japan's Panasonic Corp.'s Sanyo Electric, Hitachi Ltd. and GS Yuasa Corp. and South Korea's LG Chem Ltd. and Samsung Electronics Co., said Menahem Anderman, president of Total Battery Consulting Inc., in Oregon House, California. A123's ability to make the new cells efficiently is essential, he said. "If it can be reproduced in high volume without affecting the cost, it could certainly be significant," Anderman said. Compared with its Japanese and Korean counterparts, the U.S. company is "far from competitive in manufacturing," he said. In addition to Fisker, A123 supplies batteries for General Motors Co.'s Spark electric car; BMW AG's BMW 5-series hybrid sedan; rechargeable and hybrid cars from China's SAIC Motor Corp.; buses made by Daimler AG and Volvo AB; and delivery trucks built by Smith Electric Vehicles Corp. Along with regaining investor confidence, A123 and other lithium ion cell companies are seeking to reassure automakers they can deliver batteries with promised quality and cost levels. "We do get exposed to a lot of the upcoming advancements in battery technology," Elon Musk, co-founder and CEO of Tesla Motors Inc., said June 6 at the electric-car maker's shareholder meeting in Mountain View, California. Tesla, which begins delivering its battery-powered Model S sedan on June 22, isn't an A123 customer. "There are few industries with more BS than the battery industry," Musk said of battery makers, without elaborating. "It's quite remarkable."